Home » Western Feast Dry Dog Food 28 lb. Western Feast Dry Dog Food 28 lb. Earthborn Holistic® Western Feast™ is a hearty, protein-packed recipe featuring lean beef and pork proteins. Grain-free, gluten-free and potato-free, this alternative diet provides your dog with all the nutrition and great taste needed to satisfy his ancestral cravings. Western Feast™ is packed with wholesome vegetables and fruits, vitamins, minerals and all of the essential nutrients needed for everyday optimal health. * Not recognized as an essential ingredient by the AAFCO Dog Food Nutrient Profiles. 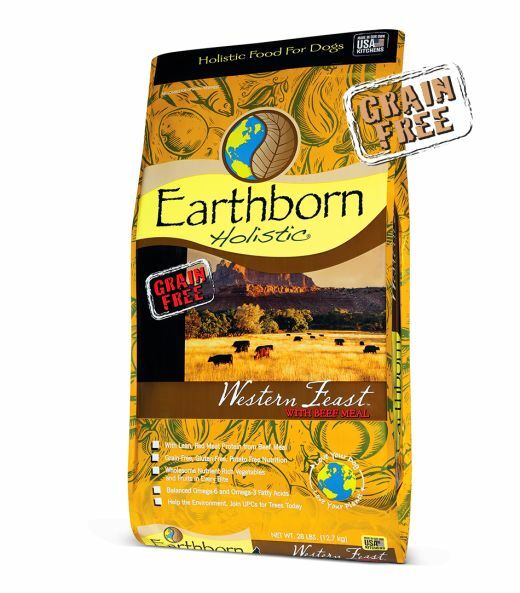 Earthborn Holistic® Western Feast™ is formulated to meet the nutritional levels established by the Association of American Feed Control Officials (AAFCO) Dog Food Nutrient Profiles for all life stages, except for growth of large size dogs (70 lbs. or more as an adult).